Everyone loses hair all the time, maybe up to 100 strands a day. They fall out, then grow back in, and the cycle starts over again. But eventually, most guys will start to notice that they’re losing more than before -- and it’s not growing back. As many as 85% of men will have some sort of hair loss in their lifetime. It can happen for different reasons. Up to 95% of guys with thinning hair can blame it on this condition. It’s caused by genes you get from your parents. Scientists think the gene may affect how sensitive your hair follicles are to a hormone called DHT, which makes them shrink. As they get smaller, the hair that grows back tends to be finer, thinner, and shorter. Eventually, it takes longer for hair to grow back. Then, the follicles will shrink so that no hair grows at all. Male pattern baldness shows up in a telltale shape: a receding hairline with thinning strands around the crown of your head. Over time, that area will go bald, but you’ll still have a horseshoe pattern of hair above your ears circling to the lower back of the head. Men with this trait can start to lose their locks as early as their early teens. In general, the sooner it starts, the greater the loss will be. Other types of hair loss tend to happen faster than male pattern baldness. Spot baldness, or alopecia areata, makes your hair fall out in smooth, round patches, but it usually grows back. The condition is a type of autoimmune disease, which means your body attacks itself. In this case, it destroys your hair. Scarring alopecia is a rare disease that destroys your hair follicles and makes scar tissue form in their place. Hair will not grow back. For most of these issues, your hair will grow back once you take care of what’s causing it. Are There Any Risks to Hair Loss? 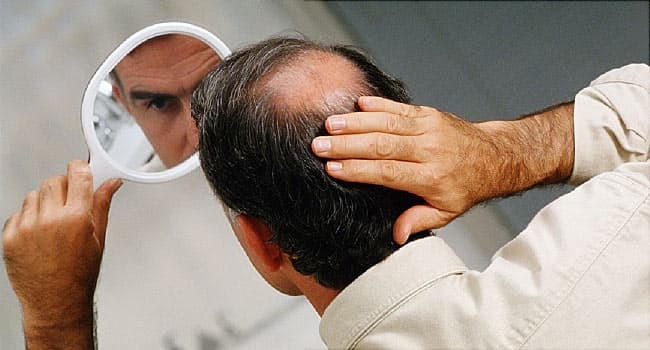 Male pattern baldness generally isn’t a sign of a serious medical problem, but it has been linked with some other conditions including coronary heart disease, an enlarged prostate or prostate cancer, diabetes, obesity, and high blood pressure. If you notice your hair starting to fall out, keep track of the pattern and how much you’re losing. You can talk to your doctor to rule out a more serious problem.